Rio Tinto Yarwun Operations general manager Mark Gilmore with Rio Tinto Yarwun operations maintenance services manager Dave O'Brien celebrate the first Amrun shipment. Image: Rio Tinto. Rio Tinto has completed commissioning of the Amrun mine in Far North Queensland ahead of schedule and as global supply of the higher-grade bauxite produced at the site becomes scarcer. 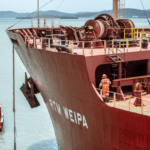 The company, which shipped its first bauxite cargo from Amrun three months ago, is replacing production from the nearby, depleting East Weipa mine with the $2.6 billion operations. Rio Tinto will increase annual bauxite export capacity by around 10 million tonnes through the mine. The company expects to reach a full production rate of 22.8 million tonnes a year, with options to expand, during 2019. Rio Tinto chief executive officer Jean-Sébastien Jacques said Amrun was completed early and under budget, demonstrating the company’s productivity and innovation capabilities. “By applying fresh thinking we also delivered safety, environmental, cost and timing benefits,” Jacques said. Rio Tinto’s focus on innovation at Amrun has included a one kilometre export facility built in modules off site that were then delivered to the operation for connection. The facility reduced over-water construction and painting in the culturally significant and environmentally-sensitive region and reduced construction time by a year. It also increased safety by removing the need for 300,000 work hours that would have been spent at height and over water. Amrun is 40 kilometres from the East Weipa mine. Rio Tinto approved the mine, plant and export facility in 2015, with a targeted start date of 2019. At the peak of construction, 1200 people worked at the Amrun site. The development also included the employment of close to 400 Aboriginal and Torres Strait Islander people. 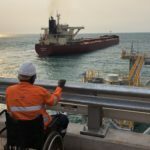 The first shipment to Rio Tinto’s Yarwun alumina refinery at Gladstone in Queensland, achieved six weeks ahead of schedule, featured more than 80,000 tonnes of bauxite. 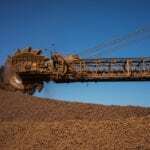 Australian Minister for Resources and Northern Australia Matt Canavan said the higher-grade bauxite being mined at Amrun was becoming scarcer around the world. Rio Tinto’s bauxite-to-aluminium supply chain invests $3.7 billion in Australian wages, suppliers and community contributions every year. The aluminium business supports 5600 jobs across Australia, including more than half of these roles in Gladstone, Queensland. Queensland Premier Annastacia Palaszczuk said Weipa’s bauxite would be used to make aluminium for mobile phones, aeroplanes, vehicles and many other applications around the world. “The Amrun project is one of the sector’s proudest achievements and I am delighted to be visiting this amazing mine and its workers once again,” Palaszczuk said. Canavan described the development of Queensland’s bauxite resources as a fabled part of the state’s history. “It was this development that spurred the growth of Gladstone as an aluminium powerhouse, and the creation of the best port in Australia,” Canavan said. Rio Tinto produced 50.4 million tonnes of bauxite in 2018, making it the world’s leading miner of the commodity.